During the 2013 Polytechnic Awards Ceremony. 2 students were awarded cash prizes for their excellent achievement in the field of journalism. 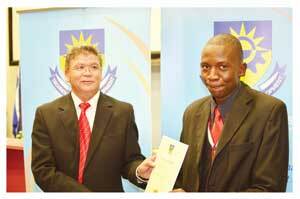 On the left, Mr Corneels Jafta, Registrar of the Polytechnic Of Namibia, hands over the Best First-Year Student Award on behalf of The Economist to Ishmael Mubwandarikwa, who is currently a second-year Journalism and Communication Technology student. 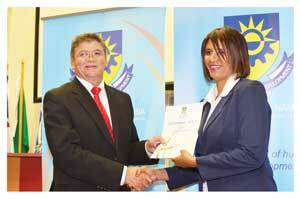 On the right he awards Margreth Nunuhe, currently a third-year Journalism and Communication Technology student.